LONDON--(BUSINESS WIRE)--The self-drive car rental market in emerging countries is expected grow at a CAGR of more than 22% during the period 2016-2020, according to Technavio’s latest report. In this report, Technavio covers the market outlook and growth prospects of the self-drive car rental market in emerging countries for 2016-2020. The market is further categorized into three segments based on body type which are hatchback, sedan and SUV. Sedans were the most preferred rented cars in the emerging countries in 2015, however, with the rising per capita disposable income in China and India SUV’s are expected to register a positive CAGR of over 27% CAGR by 2020. 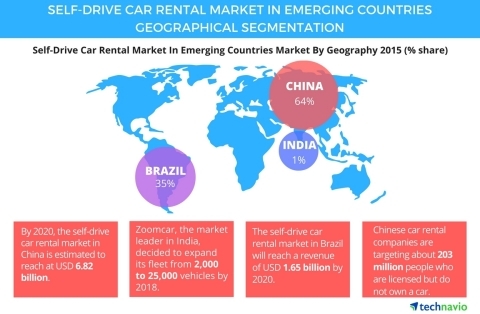 “The self-drive car rental market is evolving continuously in the emerging countries and in the past two-three years the market has experienced exponential growth in terms of service providers as well as users,” says Praveen Kumar, a lead automotive services research expert from Technavio. The self-drive car rental market in China is expected to grow at a CAGR of more than 26%. The Chinese government is taking various measures to restrict the registration of new private vehicles. “The rising pollution levels in the region, as well as the level of congestion on the roads, is making people withdraw from their decision to buy new cars, thus, paving the way for car rentals,” says Praveen. The Chinese car rental companies such as CAR are targeting about 203 million people who are licensed but do not own a car. CAR is the leading self-driving car rental company in China, with around 31% of the market share in 2015. The company manages its own fleet of cars, ensuring passenger safety. Moreover, new government regulations regarding passenger safety would have the least impact on self-drive car rental market because customers themselves are the ones driving the car and hence, the liability of passenger safety rest solely on the customers. The self-drive car rental market in Brazil is expected to generate revenues to the tune of USD 1.65 billion by 2020. The growth of the self-drive car rental market in Brazil is highly dependent on the number of tourist inflow from international and domestic leisure tourism. Tourist inflow in Brazil rises during the country’s hosting of international events like FIFA World Cup and Olympics. The Brazilian government has increased the driving privileges for foreign tourists, making them eligible for driving a vehicle throughout the country with only a passport and valid driver’s license from their respective country of origin. The main market leaders in self-drive car rentals are Localiza, Movida, and Unidas. The increase in domestic tourism is also expected to drive the market. According to the Central Bank of Brazil, there has been an increase of about 50% in the sales of holiday packages to Rio de Janeiro and Rio Grande do Norte’s capital, Natal. The self-drive car rental market is in a nascent stage and is expected to grow at a CAGR of over 72% during the forecast period. The current growth in Indian self-drive car rental market is attributable to the growth of domestic tourism, which in turn is driven by the rising purchasing power of the middle-class people, increased popularity of road-tripping, economical ride packages offered by self-drive car rental companies, and better road connectivity. Adventure tourism and wildlife tourism contribute significantly to the demand for self-drive rental cars in India. Self-drive rental cars are 30%-40% cheaper than chauffeur-driven cars since the additional cost of maintaining a driver is eliminated. Moreover, the customer has the freedom to choose from different available models of cars to rent unlike chauffeur-driven cars wherein customer’s vehicle choice is limited. The self-drive car rental market in India follows a pricing structure wherein the total cost of renting a self-drive car decreases with increase in the lease duration for which the car is being rented. MylesCar and Zoomcar are the leading self-driving car rental companies in India, with Zoomcar holding about 60% market share in 2015. The self-drive car rental market in emerging countries is expected grow at a CAGR of more than 22% during the period 2016-2020, according to Technavio’s latest report.